LAS VEGAS (AP)—Manny Pacquiao put on yet another dominating performance Saturday night, knocking down Miguel Cotto twice and turning his face into a bloody mess before finally stopping him 55 seconds into the 12th round. 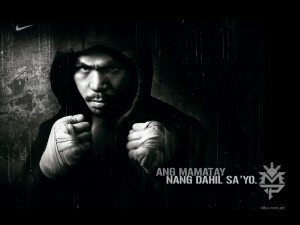 Pacquiao used his blazing speed and power from both hands to win his seventh title in seven weight classes and cement his stature as the best pound-for-pound fighter in the world. Cotto took such a beating that his face was a river of red from the fury of Pacquiao’s punches. Pacquiao dropped Cotto with a right hand early in the third round, but he wasn’t badly hurt and came back to finish the round strong. But after Pacquiao put Cotto on the canvas with a big left hand as Cotto was advancing forward late in the fourth round, Cotto was never the same again. Cotto fought gamely but in the later rounds he was just trying to survive as blood flowed down his face and Pacquiao kept coming after him relentlessly. This entry was posted on November 14, 2009 at 8:30 am, and is filed under News. Follow any responses to this post through RSS 2.0. You can leave a response or trackback from your own site.